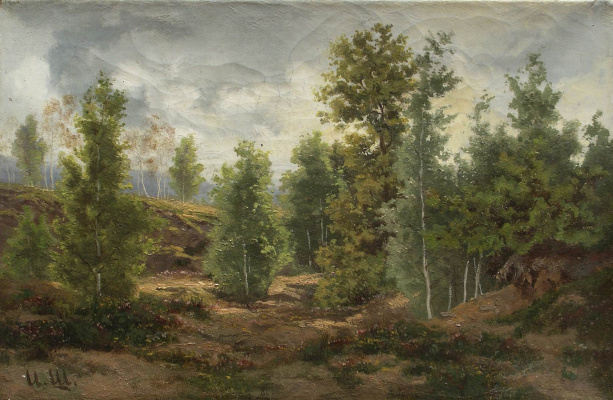 The Picture Shishkin "Rye" the audience first saw in the year of its creation at the VI traveling exhibition. 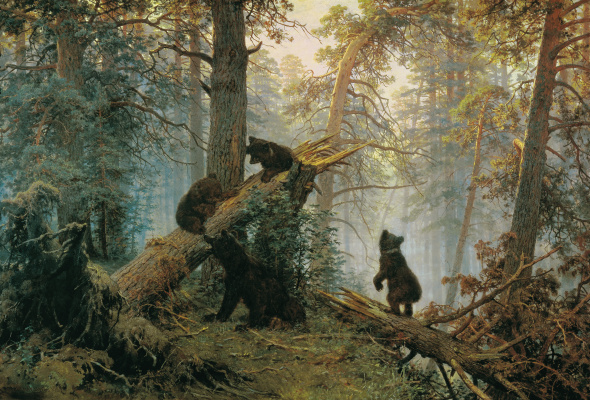 Ivan Kramskoy in a letter to Repin, discussing the exhibited work, said: "I will speak in the order in which (in my opinion) things in the inner dignity are at the exhibition. 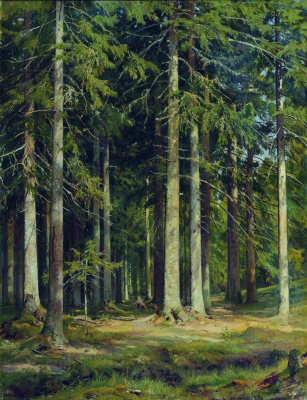 The first place is Shishkin "Rye",". Painting inspired by the homeland of the artist – Elabuga. Survived several pencil sketches one of them is marked, clearly tells us that "I wanted to tell the author": "Expanse, space, land. Rye. The grace of God. Russian wealth". 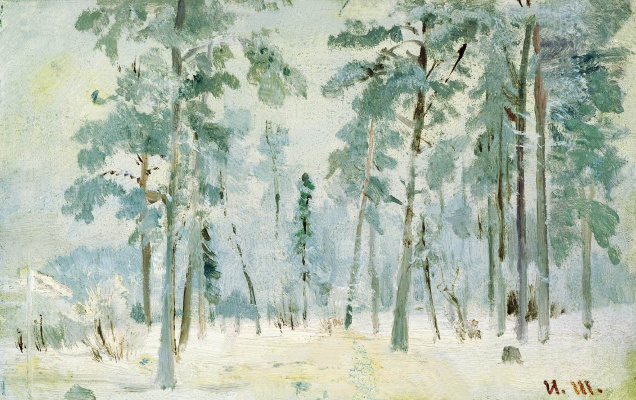 Before us is a typical Russian landscape, designed to reflect these conditions. 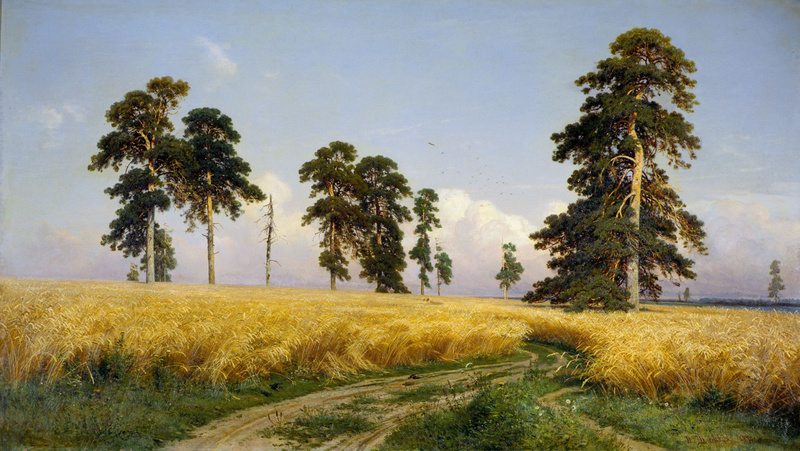 The road is a popular motive of Russian artists (1, 2). 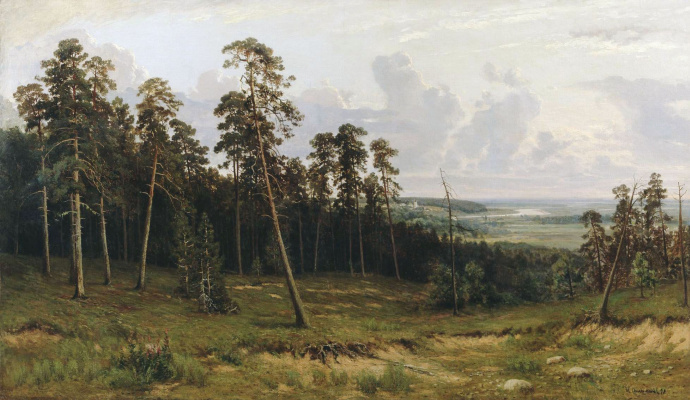 Performed by Shishkin flanked by vast fields of rye country trail possesses that power and monumentality that becomes one of the symbols of Russian life in General. The tone of the picture light calm, restrained. It seems, looking at her, you can hear the tunes of folk songs. The earth is filled with heat, felt the dry hot wind of the spoken and the waves rolled on the Golden eared rye, and spanning the sky. All this creates a foretaste of the storm that may erupt in the near future. 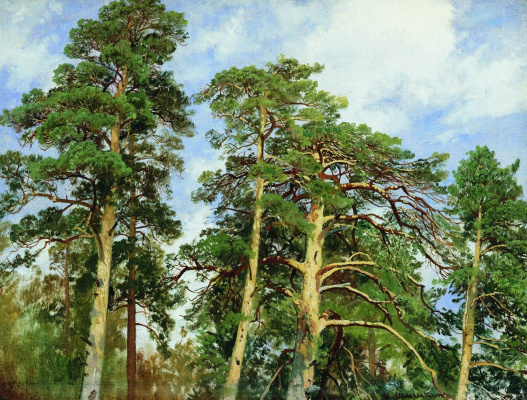 The structuring component of the landscape are so beloved Shishkin pine. Their trunks graceful and monumental, like the ancient colonnade. Flying above the trail Swifts enliven the landscape. Barely seen in the background of the heads of walking people first, demonstrate the vastness of open spaces (people are tiny), moreover, link the landscape and humans, arguing that we have not just a view of nature, and the story of "how life in Russia" – in this case is not incriminating, but rather blissful, in a tone of admiration. 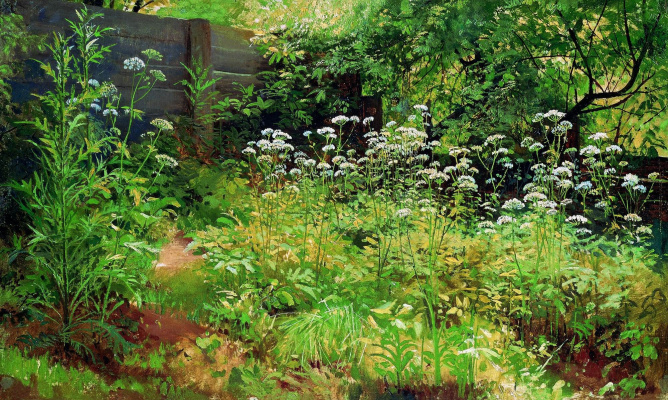 Having peered more closely, habitually find peculiar to Shishkin thoroughness in the image every blade of grass, each stalk and blade. 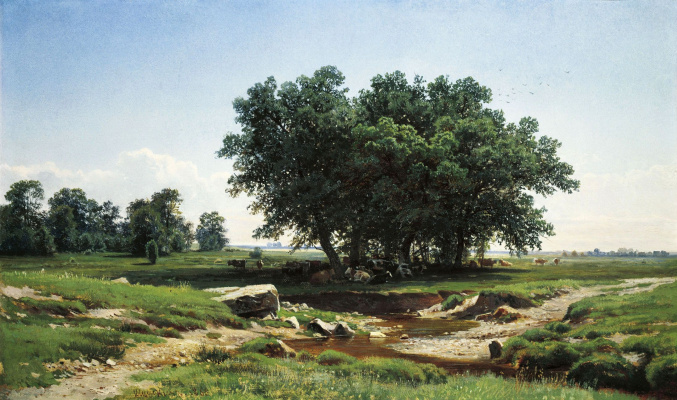 If we consider the painting in light of the social and artistic trends, by the late 1870s, it became clear that one conviction Wanderers will not go away. There is a need in any positive ideals, and landscape perfectly filled this lacuna. 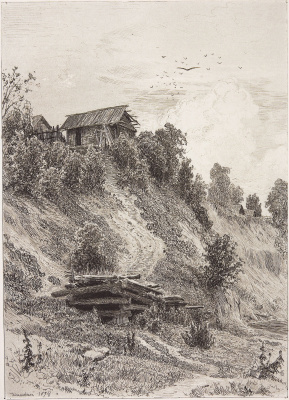 Shishkin road in this picture is not the way of sorrow (as, for example, "Vladimirka" Levitan). There is anguish and despair, she is not a dead end. The mood of the picture – more of a thanksgiving to life, the enjoyment of the vast expanse, admiring the ascent of the spirit. This is a bright road. The forerunner of this picture can be considered written almost a decade earlier "Noon. In the vicinity of Moscow". Here we have already outlined the same theme: the breadth of vast open spaces, the joy of a simple life, filled with light and sun. 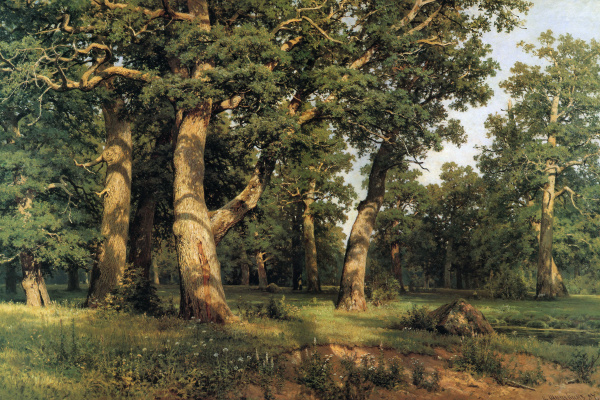 However, the idealizations we have Shishkin't find any, he remains the greatest realist. This is not an idealization, and the perspective on Russian reality is not particularly familiar with the joyful side.